A nice gift is one that makes you feel good, one that brings a smile when you wear it, or look at it. Our reggae pack vibrates. Add it to your 7 day ticket or multi-day ticket purchase for only €25 and we’ll send it home. When you buy your ticket for the festival you can add an exclusive Rototom Sunsplash pack for only €25. 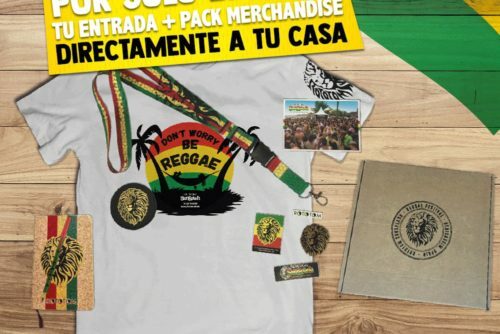 The pack includes: key chain, Rototom Sunsplash postcard, large self-adhesive patch, 4 stickers, recycled paper cork note pad and tricolor Bic pen; organic limited edition cotton t-shirt. A nice gift is one that makes you feel good, one that brings a smile when you wear it, or look at it. Our reggae pack vibrates. 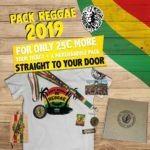 Then just add €25 to your 7 day ticket or multi-day ticket purchase to enjoy Rototom 2019 with this limited edition GIFT! No shipping costs for Spain (peninsula and Balearic Islands); €4 for the Canaries; €7.50 for Europe and €12.50 for the rest of the world. PreviousPrevious post:Our solidarity actions multiplied by sixNextNext post:Until February 8, get your Rototom 2019 ticket for a special price.